Skylight Books has a great intellectual feel. The strip on which it sits feels like a swoop of Europe carved out for Los Angeles. The books are carefully curated. The children's section is no less worthy than the philosophy section. 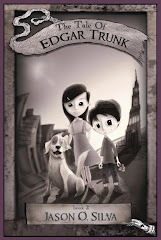 However, you will only find The Tale of Edgar Trunk: book 1 in one of them, nestled between Hugo Cabret and Lemony Snicket's A Series of Unfortunate Events. To be in great company! !